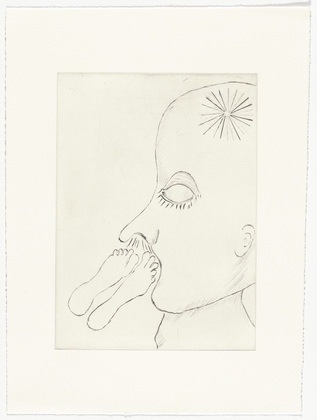 MOMA just announced today the online catalog of Louis Bourgeois’s entire print collection, “The Complete Prints & Books”. This is a collection of over 3,500 works and includes previously unpublished works. The gargantuan task of uploading each print and properly cataloging is still ongoing. Out of 16 themes ranging from Spirals to Animals and Insects, there are only two which are ready for perusing – the Spiders and the Fabric Works I themes. This is only 400 works uploaded so far. The catalog is an incredible resource for those curious about her work and process. Understanding the more intimate scale of the print work, and the fact that she did prints only early and very late in her career is very telling. Yes, there is a feature in the catalog that you can compare images. If you are only familiar with Louis Bourgeois’s monumental works I highly recommend doing a search around this database, it’s fascinating. And most definitely revisiting it in a year, as they are adding to it continually. Other Remarks:According to Bourgeois’s assistant, Jerry Gorovoy, this imagery relates to Marcel Proust and his references to memory, with the star in the head suggesting recall and imagination. Gorovoy also noted that as a child, Bourgeois helped her father put on his slippers and the smell of feet brought back those memories.